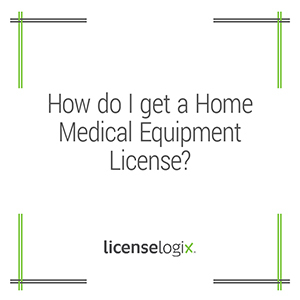 How do I get Home Medical Equipment License? Every jurisdiction is different. Some states do not issues Durable Medical Equipment, or Home Medical Equipment, licenses at all, while other states may require a DME license for certain types of suppliers and/or certain types of equipment. LicenseLogix can research all 51 jurisdictions for you, and based on the specifics of your business, determine exactly which licenses you need. To get started right away, please contact us.